*Heiress* - Anne Neville was the daughter of the Earl of Warwick, the Kingmaker, the wealthiest and one of the most powerful peers in England. From an early age Anne knows that her marriage will be political, that she is but a pawn to be used to further her familys interests. When Richard, Duke of Gloucester, joins the household , the attraction between the two young people grows and their betrothal is an event welcome to both. *Princess* - Her happiness is shortlived. When her father decides to exchange the white rose of York for the red rose of Lancaster he commits an act of treason and the family is exiled to France. Anne is forced into an uneasy betrothal with Prince Edward of Lancaster, an unstable young man completely under the control of his mother, Margaret of Anjou. The marriage takes place but Margaret prevents it from being consummated. As the struggle for England's crown continues both Prince Edward and the Earl of Warwick lose their lives at the Battle of Tewkesbury. *Widow* - Anne is now the virgin widow and returns to England to be placed in the care of the Duke of Clarence who plots to have her sent to a nunnery so he can obtain her inheritance. She is rescued by Richard , they marry and when he takes the crown in 1483 she will become Queen of England. While Virgin Widow was a little too much 'love story' for me I would recommend it to anyone who is interested in learning about the War of the Roses. The complex tangle of families and their ever-changing allegiances can make this period of English history difficult to understand and too many historical facts can leave one floundering in confusion. Anne's life was eventful enough to make an engrossing and engaging adventure story and I liked the way Anne and Richard were portrayed - whatever the truth of their relationship it is recorded that he wept publicly when she died which makes the romance plausible. With her historical background of this tumultuous time the author stays (most of the time)with the known facts. The only thing I didn't care for was her interpretation of the relationship between Margaret of Anjou and her son. Anne O'Brien ends the book at an early point in Richard and Anne's life together but provides a section at its conclusion that gives information of what came after , suggestions for further reading and book club discussion questions. 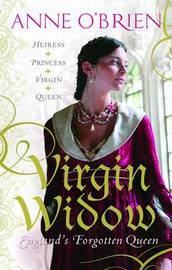 Virgin Widow should appeal to readers of historical fiction who like a fast-flowing story with the emphasis on romance and adventure. I like the history part of this story.